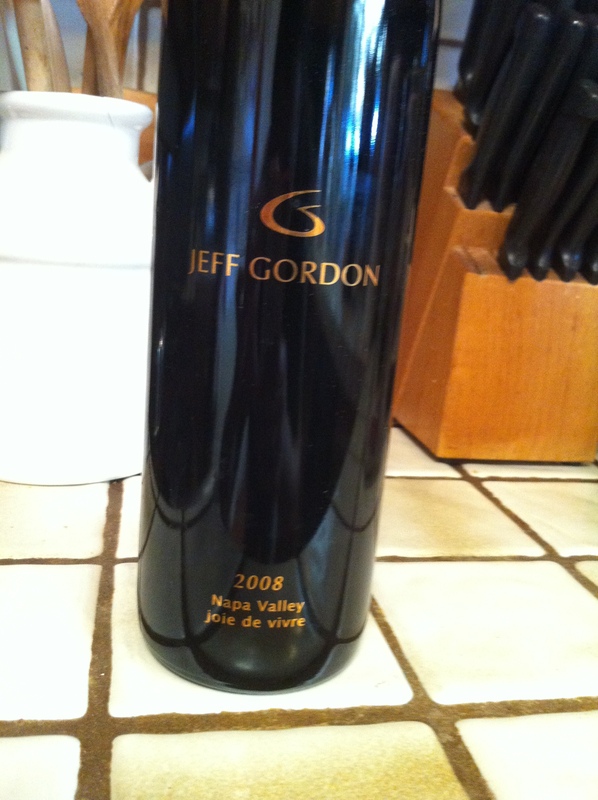 How many of you knew that NASCAR champion Jeff Gordon was a wine lover with his own wine label? That’s right; Jeff Gordon is the man behind Jeff Gordon Cellars. Jeff Gordon’s passion for wine stemmed from a bottle of Montrachet that he once ordered from a restaurant and fell in love with. Can you blame him? On October 24, Jeff Gordon Wine was kind enough to invite several wine bloggers of the Twitter wine community for a live Twitter tasting of his beloved wine, his 2008 Joie De Vivre. Running late from work, as always, I was able to get in on the tail end of the discussion. The wine was a huge hit among the bloggers and created a wonderful and interesting discussion which Jeff Gordon himself, participated in. I was truly wowed by his wine and wanted to share my thoughts about it. The Jeff Gordon 2008 Joie De Vivre is a red blend composed of Cabernet Sauvignon, Merlot, and Syrah. All fruit for the wine is sourced from Napa Valley. The wine is barrel aged in a combination of American and French oak for 20 months. In the glass, the wine pours a deep garnet color with long legs upon swirling. The nose of the wine is filled with lush boysenberry, blueberry pie, cherry, mocha, espresso, and a touch of cedar. There are generous fruit flavors on the palate; boysenberry, blueberry, dark cherry, and plum. There are also hints of dark chocolate, espresso, spice, and vanilla. The wine is full bodied with firm tannins. The wine finishes long and there is a touch of pepper you get from the Syrah. There is a lot of complexity going on with this wine. I really enjoyed it. I paired it with New York steak with sautéed mushrooms. This wine has definite aging potential. I highly recommend this wine. It’s wonderful and pairs well with a range of hearty foods. It’s a great wine to try right away and save a bottle for years down the line. There were only 254 cases produced, so be sure to get your hands on some. The wine can be purchased directly off the website. It sells for $61 per bottle. A very special thank you to Jeff Gordon Cellars for putting this event together and inviting us to participate. It was very informative and a lot of fun. * This wine was provided as a media sample for review. This entry was posted in Uncategorized and tagged 2008, Cabernet Sauvignon, Carneros, Jeff Gordon, Jeff Gordon Cellars, Merlot, Napa Valley, NASCAR, Syrah, Wine Reviews. Bookmark the permalink. This Jeff Gordon wine sounds amazing! The price is not an every day wine.. but I can make an exception. Now let’s see if I can find it at my local Binny’s?